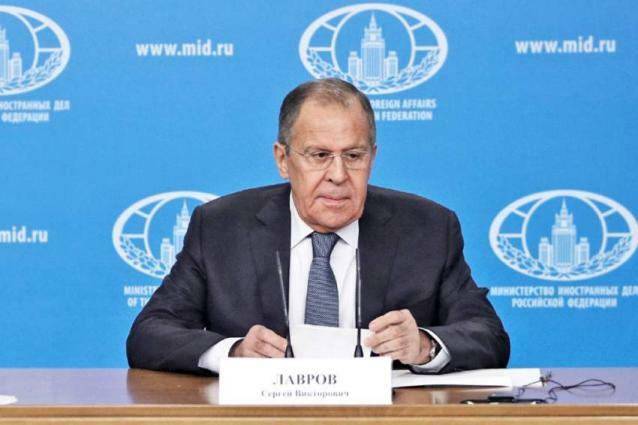 MOSCOW (UrduPoint News / Sputnik - 17th April, 2019) The situation on the ground in Syria does not create any obstacles to the formation of the constitutional committee, Russian Foreign Minister Sergey Lavrov said on Wednesday, stressing that the body should be formed as soon as possible. "The constitutional committee should be formed as soon as possible. The situation on the ground does not prevent this. The situation on the ground is still more or less stable, but we will have to solve the problem of eliminating the terrorist hotbed in Idlib on the basis of Russian-Turkish agreements," Lavrov said after a meeting with Serbian Foreign Minister Ivica Dacic. He stressed that one of the Syrian authorities' tasks was to regain control over the left bank of the Euphrates River. "It is necessary to solve the problem in the northeast, on the left bank of the Euphrates, prioritizing the restoration of the legitimate Syrian government's authority, the establishment of their dialogue with the Kurds, and ensuring Turkey's security interests on the border with the Syrian Arab Republic," Lavrov said. The constitutional committee will be charged with overhauling the Syrian constitution. The Syrian government and the opposition each submitted a roster of members in September 2018, but a dispute over UN-proposed independent candidates prevented the panel from being convened by the end of the previous year.